When converting RGB color to CMYK color, do you check the “color settings” in Photoshop or do you just go to Image - Mode - CMYK? Not checking the color settings first could lead to unwanted color shifts in your images. In Photoshop, go to the Menu bar, select Edit - Color Settings. Go to the Menu bar, select Photoshop - Color Settings. Change your settings to match Figure 1. In the Working Spaces area, select Custom from the CMYK dropdown. Change your settings to match the Custom CMYK window (Figure 2). 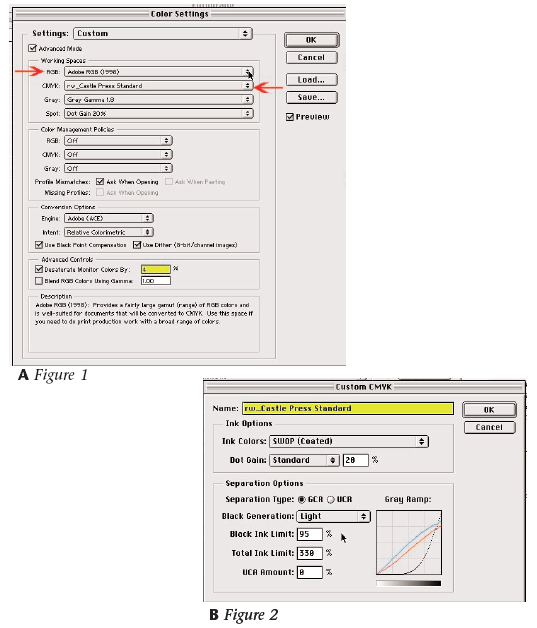 With these settings active you will get the best possible RGB to CMYK conversions. Photoshop A software program developed by Adobe Systems that is used to create raster based images. RGB Visible light: the primary colors of red, green and blue seen on the electromagnetic scale. This is monitor color and cannot be printed.